Choke Republic is a lifestyle apparel brand with deep roots in Brazilian Jiu Jitsu culture. Based in San Diego, California, the brand was started by a group of BJJ experts who wanted to combine premium quality clothing with creativity and good times. The brand has become one of the most recognisable fight wear names on the market and the current range of Choke Republic clothing at Fighters Market EU is perfect for the gym, day to day wear or in the ring. Choke Republic designs are instantly recognisable, combining quality fabrics with iconic slogans and logos. 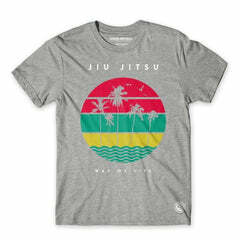 We love their 'Coffee then Jiu Jitsu' and 'Beer then Jiu Jitsu' range, along with their signature Choke Republic logo designs. The current Choke Republic collection at Fighters Market includes t-shirts, hoodies,hats and accessories in a range of sizes and styles. Shop the full Choke Republic collection below and add some San Diego style to your kit today.